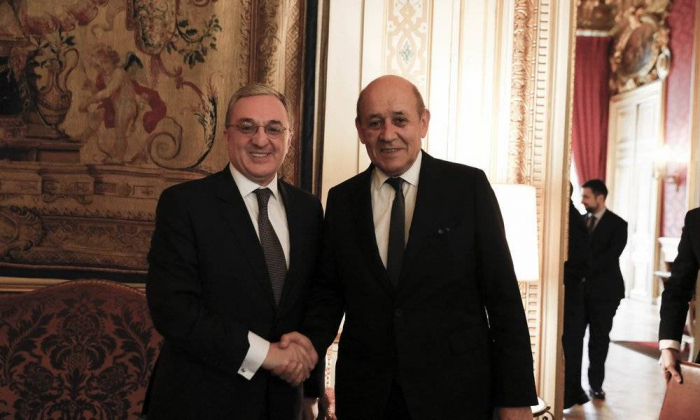 French Minister for Europe and Foreign Affairs Jean-Yves Le Drian discussed the settlement of the Nagorno-Karabakh conflict with his Armenian counterpart Zohrab Mnatsakanyan in Paris, said a statement from the French Ministry for Europe and Foreign Affairs. During the meeting the sides reviewed the recent discussions between Armenia and Azerbaijan. The French minister was informed about the details of the April 15 meeting between Azerbaijani, Russian and Armenian foreign ministers in Moscow. Jean-Yves Le Drian, in turn, reaffirmed France’s determination, in its capacity as co-chair of the Minsk Group, to remain committed to finding a negotiated settlement to the conflict.